fluffnflowers: Health, life, and gardening. The past week has been filled with doctor appointments and imaging appointments, and it looks like it's going to keep going for the next week or so. Being tired puts a damper on how much I'm outside, but I've been going out and taking the occasional snap. 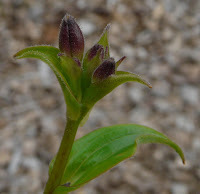 For example, my toad lily is going to bloom for the first time! It's Taipei Silk, I think, and has really been suffering since I moved it. I had to move everything in the spring in preparation for some major outside house renovations, and it's been getting too much sun and not enough water. So I'm excited. I'll have to go outside in a bit, when the rain (thanks, Fay! we've needed it!) settles down, and see if it's survived the downpour.